Most online experiences involve some form of value transfer. Especially in the majority of games that follow the freemium model. This means that the game is provided free of charge but that the company makes their money from small, repeat purchases inside the game. Usually this is done with a credit card and a payment provider. Any online experience that requires transfer of value or payment is the perfect use-case for cryptocurrencies. Enjin takes on this challenge by creating a cryptocurrency ecosystem centered around online games. What Features Are On The Enjin Platform? 1 What Features Are On The Enjin Platform? 2 Can Enjin Be Integrated With The Actual Game? 3 Where’s The Bit About A Blockchain Solution to Gaming? 4 What is Enjin Coin (ENJ)? 5 What Else Can You Build With The Enjin SDK? 6 How Do You Buy Enjin ENJ? 7 The Enjin Digital Smart Wallet? 10 Is The Team Trustworthy? 11 What Is The Enjin Roadmap? 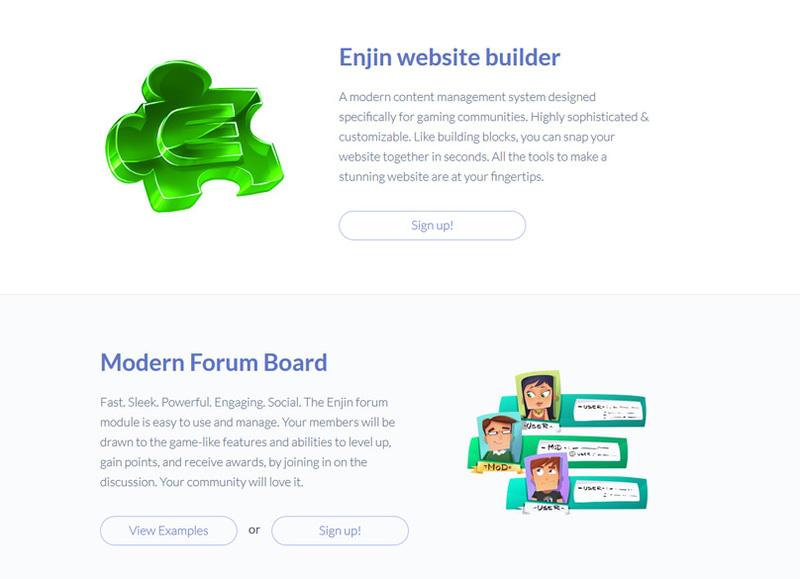 Enjin offers an all-in-one website platform for creating engaged communities around specific gaming platforms. It has its own content management system (CMS) and website builder. The website builder is drag and drop which means you need no coding experience to put together a world-class looking website. This is perfect for tech-savvy beginners as well as skilled programmers who would love to save some time and effort. The Enjin platform has forums that comes pre-built with the standard discussion features. It is designed on gamification principles where users can gain points, get awards and level up by building their reputation in the community. Also included is an Enjin native app for Android and iOS devices that serves your specific community. It includes all the content from across your modules on the Enjin platform in one easy place for your tribe to access. The advantage of this is that users will get push notifications through the app so that they are never out of the loop. Can Enjin Be Integrated With The Actual Game? Indeed. The Enjin CMS has plugins that integrate with most of the major games that are out there at the moment. Games supported include Minecraft, World of Warcraft (WoW), Battlefield 1 and at least 7 other popular games. Examples include importing and syncing of WoW guild characters and ranks from the game to the Enjin platform. The character and guild data is automatically synced and updated daily. Where’s The Bit About A Blockchain Solution to Gaming? You’re right. For the article to be on this site there has to be a bit about the blockchain technology involved! 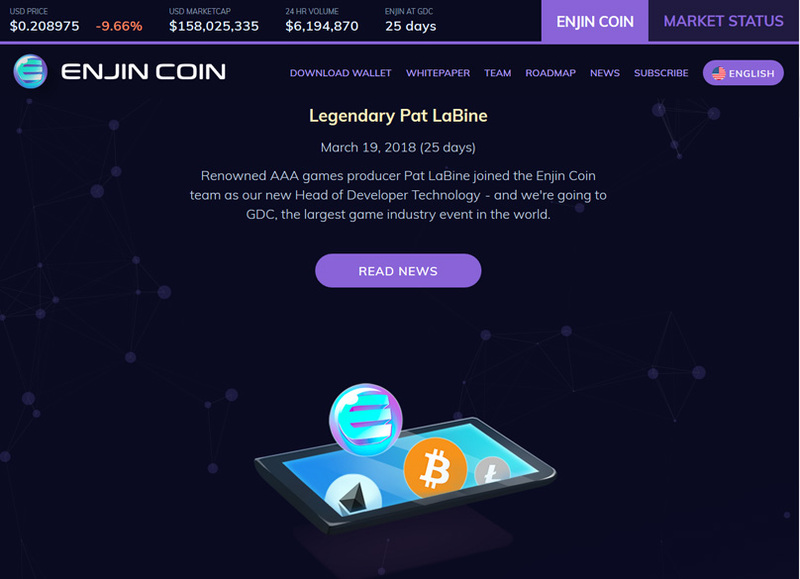 The Enjin platform has its own cryptocurrency called Enjin Coin (ENJ). It is an Ethereum-based ERC-20 token. It comes with the benefit of Ethereum’s native smart contracts as well as a host of software development kits (SDKs) to scale on the platform. The aim of ENJ is to represent virtual goods on the blockchain. As mentioned in other articles, the premise of the blockchain is that anything can be represented as a token. The SDKs are intended for game developers to create integrations that will span across different games. Gamers can then trade their digital assets between games and grow their online portfolio with real world value. The token also solved the problem of online fraud with in-game purchases. It is estimated that for every valid transaction there are 7.5 transactions that are fraudulent. Enjin Coin comes with the benefit of enhanced trust, security and very low transaction fees. What Else Can You Build With The Enjin SDK? The Enjin SDK makes it easy for developers to build their own decentralized payment gateway. Think PayPal for the blockchain. The ability is there to build custom shopping carts, web invoices, email and sms notifications as well as refunds. One great feature of this application is that payment gateways built on Enjin can pay multiple people in one transaction. Funds are divided up to the relevant users based on the smart contract agreement already in place. A great use of this would be for profit sharing from pools where tokens are distributed automatically to multiple parties based on an agreed distribution. 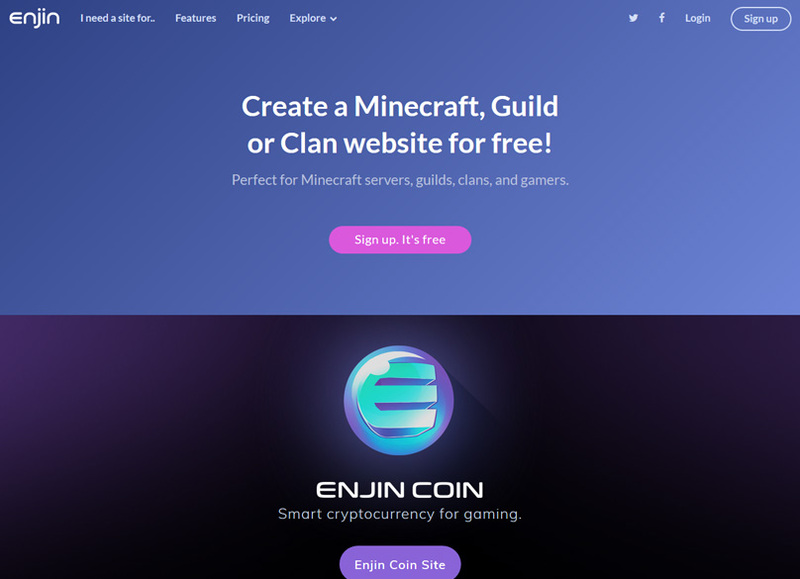 How Do You Buy Enjin ENJ? 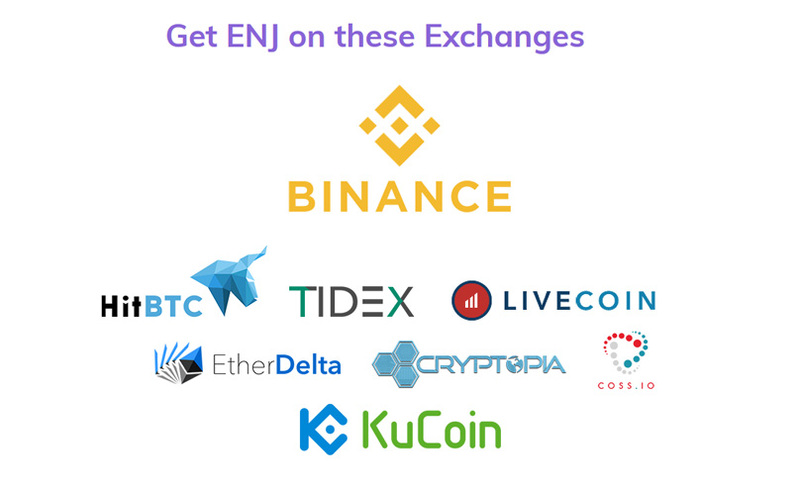 You are not able to purchase ENJ with “Fiat” currency so you will need to first purchase another currency – the easiest to buy are Bitcoin or Ethereum which you can do at Coinbase using a bank transfer or debit / credit card purchase and then trade that for ENJ at an exchange such as Binance. You can now send your Ether over to Binance to make your purchase of ENJ, take a look at our review of Binance here to see how to signup and purchase on their exchange. 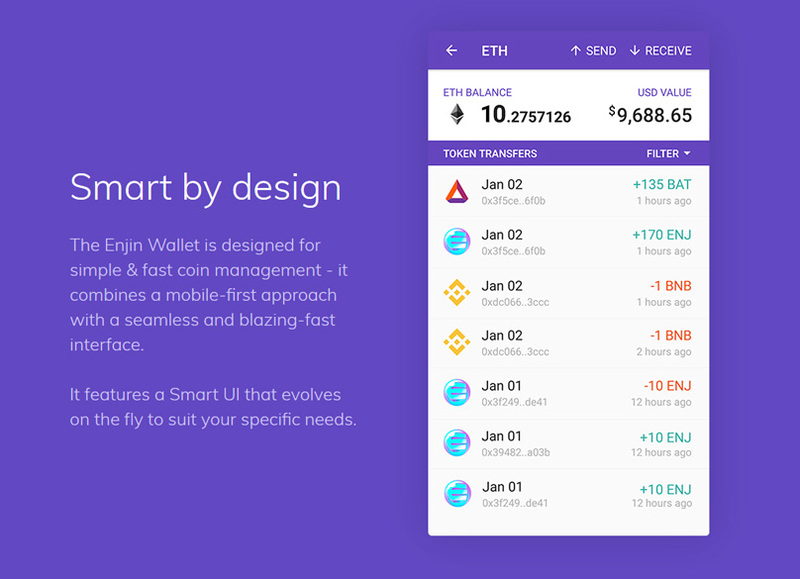 The Enjin Digital Smart Wallet? Enjin have spent a lot of effort building secure, multicoin, native mobile wallets for Android and iOS devices. There is also an APK file available to download for Android devices. The wallet boasts innovative security features and a smart UI that evolves to the user’s needs. 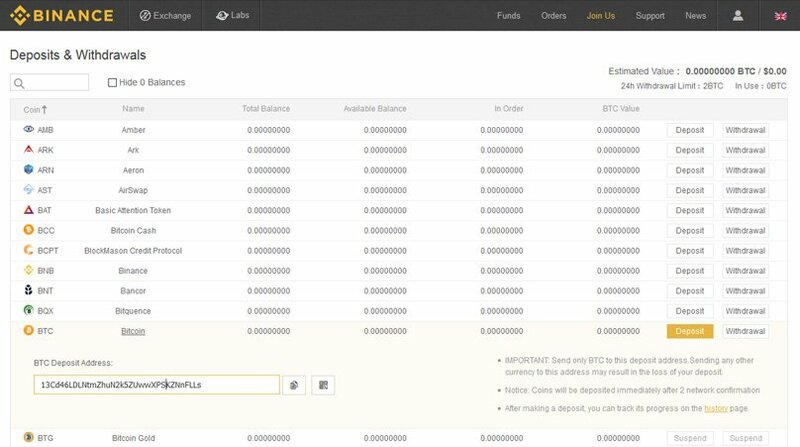 The wallet supports Bitcoin, Ethereum, Litecoin and the Enjin Coin and any ERC-20 Ethereum-based coin. They also plan to introduce support for other altcoins in future. The best security feature is the Enjin Secure Keyboard. It is a keyboard that is natively built into the app and prevents any snooping software or keyloggers to capture your passwords and private keys. They keyboard can even be set to randomize the keys for those who have ultimate security paranoia. The wallet uses two different layers of cryptography to keep your data safe. At a hardware level there is Advanced Encryption Standard (AES) and the software itself also users custom software encryption. Any data that is processed is kept in encrypted memory. The app also blocks any video recording or screenshot attempts of the wallet at an operating system level. Every member of your community will have a profile and users can send messages to other users. There is also a wall which shows a feed of the user’s latest activity and interactions. This allows users to stay up to date with all their interactions on the Enjin platform. It also displays their rankings and awards to the rest of the community for bragging rights. Whatever your gaming community needs, Enjin has a module that can extend the standard functionality. With well over 50 modules there is support for wikis, support ticket systems, forum boards, chat groups, shopping carts and blogs. The team has proven expertise in the fields of cryptocurrencies, software development, marketing and business. 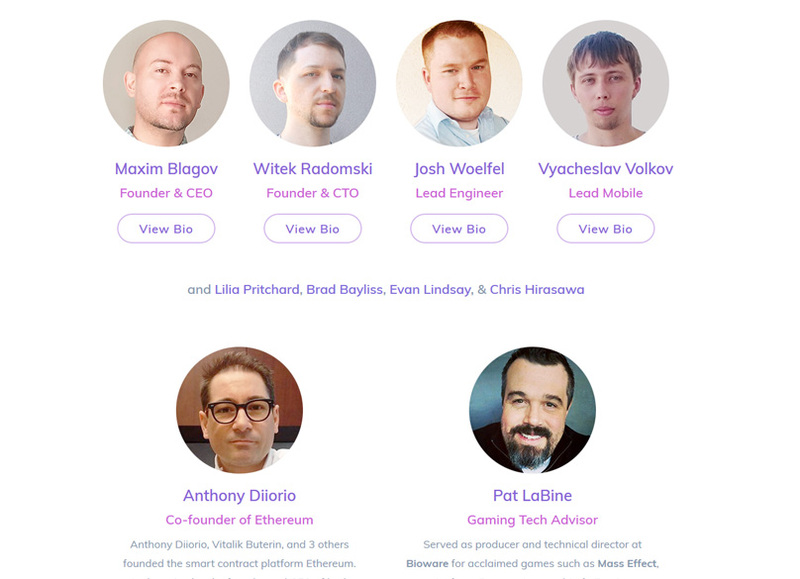 They also list the co-founder of Ethereum, Anthony Diiorio as one of their business advisors. 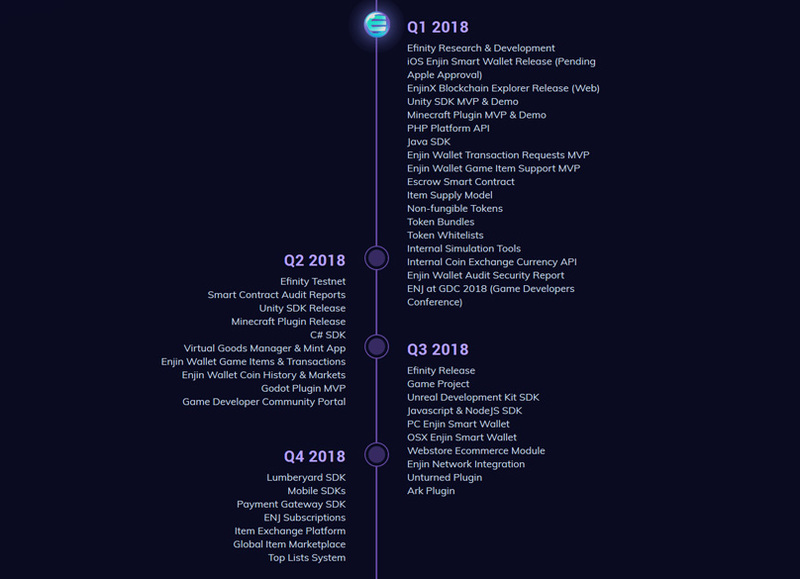 What Is The Enjin Roadmap? The most exciting development for road ahead is the partnership with Efinity. The Efinity network can be seen to Enjin as the Lightning Network is to Bitcoin. It is a sidechain that runs on separate infrastructure. 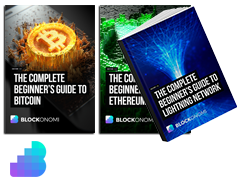 The Bitcoin and Ethereum networks are already highly congested and can be slow at times. They are also expensive with high transaction fees. The solution was to incorporate Efinity into the Enjin offering. The Enjin platform will be able to scale to millions of users and offer high speed and almost zero transaction costs. The benefit is that the transactions on this blockchain will remain trustless and can be verified on the Ethereum blockchain. In this sense Efinity can be seen as a framework for developers to build games that are decentralized. The nature of trustless gameplay is a new notion and will break new ground in video gaming. The EnjinX Blockchain Explorer is also planned which will be a web-based explorer for multiple blockchains. Interestingly, it will also allow the browsing of ENJ game assets in future. It is clear that Enjin has a solid use-case for the Enjin platform and services and that the ecosystem has already infiltrated the gaming community. The company plans to host a presentation at the 2018 Game Developers Conference in San Francisco which will go far to bolster their reputation within the development community. Since developers are usually early adopters, getting them excited and included in the ENJ token will be a great boost for the company.